Part of 2012 National Year of Reading. 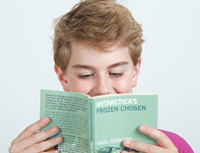 Those who are chosen to work in Antarctica are called 'the frozen chosen'.The author was on an Australian Antarctic expedition in 2001. 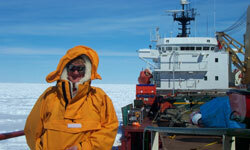 While 'beset' in the polar ice, Hazel started writing this novel with the expert help of the 'boffins' and 'tradies' onboard the polar re-supply ship. When Kyle gets a job for the Antarctic summer as a marine biologist, his Spanish girlfriend Jade e-mails daily.Jade, an eco-activist is involved with an online protest group, but doesn't realise she's being used. Patagonian Toothfish poachers! Genetic modifications crossing over from rats to humans, quarantines the expeditioners and Kyle dicovers that courage is more than physical bravery. Saying no to your mates takes courage too. Available on Kindle are Antarctic Dognapping and Shooting Antarctica, an easy reading mystery for developing adult literacy. 'Outback Ferals' is the sequel, starring eco-warrior Kyle, but in the outback and around Darwin (NT) , tackling a pandemic threat & questions of mateship.